Maize or Corn has become a staple food in many parts of the world, with total production surpassing that of wheat or rice. It is a valuable cereal, food and fodder crop. The United States of America is the largest producer of corn in the world. Botanical Name: Zea mays (syn. : Zea saccharata, Zea mays everta, Zea mays rugosa). 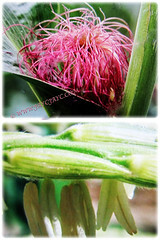 Common Names: Maize, Corn, Sweet Corn, Indian Corn, Jagung in Malay. Etymology: The genus Zea is derived from the Greek name for another cereal grain. The specific epithet mays comes from the Mexican vernacular name for maize. Origin: Native to Mexico and Central America. Plant type: An annual herbaceous grass. Features: Zea mays is from the genus Zea that consists of six accepted species with Zea mays as the best known species. It is a tall annual cereal grass that typically grows up to 2-3 m tall. It has an erect growth form with usually 1 main stem and 1-2 lateral branches. 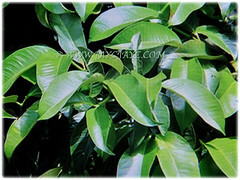 Large green leaves, measuring 50-90 cm long and 5-15 cm wide are linear to lanceolate with a prominent midrib. Each stem produces 8-21 leaves which occur singly on alternating sides of the stem with the foliar base clasping. It produces unisexual flowers that are terminally located with male and female flowers occur on the same individual. Male flowers are produced near the stem apex in a branched inflorescence known as a panicle. On the other hand, female flowers occur in the leaf axils in a modified spike inflorescence. Corn silk is a common name for the shiny, thread-like, weak fibers that grow as part of ears of corn maize. The tuft or tassel of silky fibers protrude from the tip of the ear of corn. The ear is enclosed in modified leaves called husks. Each individual fiber is an elongated style attached to an individual ovary. Flowers are coloured yellow to golden and are pollinated by wind. Plants begin to flower 20-30 days from germination. The simple fruit is actually a single corn kernel known as a caryopsis. The fruits are arranged in 16-30 consecutive rows of spikelets that are enclosed in several layers of papery tissue, termed husks and long corn silks protrude from them. The spikelets will develop into kernels when the seeds mature. Colour of mature fruit are typically white or yellow but may be black, purple and red. The period from sowing to first harvest is 70-200 days. 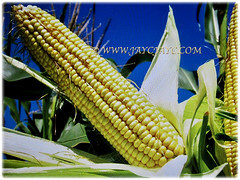 Culture (Care): Zea mays or Maize can be grown easily with least maintenance. 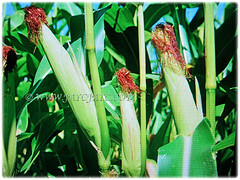 Others: Corn or Maize is a heavy feeder and must have ample nitrogen and water the soil at all times. Its corn roots do not tolerate disturbance well, therefore when thinning corn, cut the excess sprouts instead of pulling them. After corn is established, mulch to reduce weeds. Generally free from serious pests and diseases. Nonetheless, the most common pests include corn borers, flea beetles, and cutworms. Zea mays or Corn is a frost tender annual. Depending on cultivar, corn requires 65-110 frost free days from germination to harvest. Corn is most productive when the daytime temperatures are between 12-33°C and the temperatures at night are between 11-23°C. Corn cannot grow without human husbandry because the husks do not open on their own, and the ears with their seeds, simply rot on the plant. Corn grains or seeds are planted in situ after all danger of frost has past. Optimum soil temperature for germination is 21-27°C. In cool temperate climates, corn can be started in small pots a few weeks before soil temperatures become acceptable, then hardened off and transplanted outside. Maize is a spring and heat-loving crop. Seeds germinate at 10°C. Young crops survive morning and night frosts of 2-3°C and in autumn, morning and night frosts ruin young plants. It is light-demanding and quite drought-enduring. The growing period usually lasts 90-150 days. Maize is fastidious about soil. 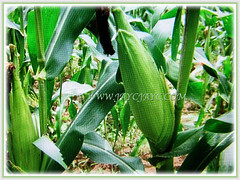 Upon application of organic and mineral fertilizers, maize yields a good harvest. Propagation: Easily propagated from seeds that germinate between 4-6 days. Usage: Zea mays or Maize has become a staple food in many parts of the world, with total production surpassing that of wheat or rice.Corn can be boiled, roasted, grilled, blended, ground and steamed. Sweet corn is most commonly used in culinary dishes. 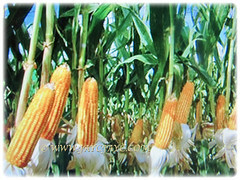 Some of the maize production is used for other maize products, such as corn starch and corn syrup. 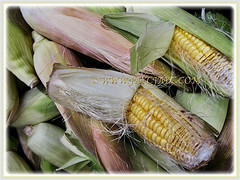 Corn is used fresh for human consumption or may be dried and ground into flour or meal. Corn oil that’s obtained from the grain is used in cooking and cornstarch from processed grain is used as a thickener in sauces and puddings. Cornstarch can be further processed enzymatically to make high-fructose corn syrup which has become widely used to replace sugar as an inexpensive sweetener in processed food and beverage products. Its seed head and whole plant are an important source of feed for livestock. The kernels (grains) are milled into flour to make doughs for various uses such as snack foods, tortillas, bread, corn pone, etc. 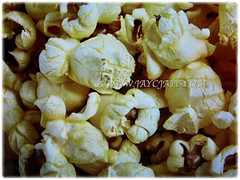 Varieties with a hard seed coating (the endosperm) explode when heated and are used for popcorn. 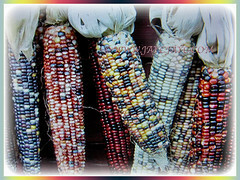 Ornamental varieties are grown for colorful husks and kernels used in dried arrangements. Corn has become an increasingly important biofuel, both in the form of corn oil (used as bio-diesel) and ethanol (an alcohol fermented and distilled from the processed kernels), which is blended with petroleum-based gasoline in various proportions for use as fuel. Corn contains numerous medicinal qualities even beyond the kernel. 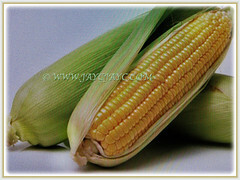 Corn silk is used for its healing properties, working on the urinary tract, kidney stones and cystitis. Cornsilk is prescribed in Chinese medicine to treat fluid retention and jaundice. Due to its high potassium content and diuretic properties, cornsilk can be used for most problems afflicting the urinary tract. Cornsilk is used for frequent urination, and soothes the lining of the urinary tract, relieving irritation and easing urinary flow. Cornsilk helps in prostate diseases where there is difficulty passing urine.